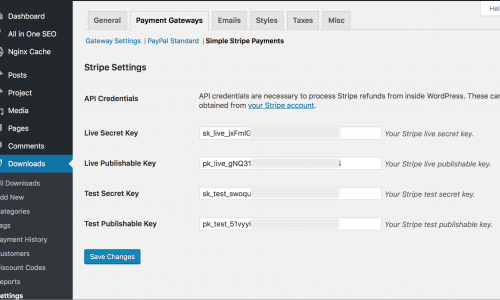 This is a WordPress plugin to add Stripe payments functionality to the Easy Digital Downloads. To buy this plugin press the Purchase button at the bottom of this page. The Stripe widget to enter the credit card information will appear. If you press the Pay button on the widget, the download link will appear on the payment confirmation screen. All the purchase process and the Purchase button are handled by this plugin. As for customer information, this plugin saves only buyers’ email address which inputted on the Stripe widget as the Easy Digital Downloads’ customer data to send receipts to buyers. Add this plugin to your WordPress in the same way to add a normal plugin. Press the “Upload Plugin” button on the “Add plugins” screen. Upload the .zip file of this plugin. 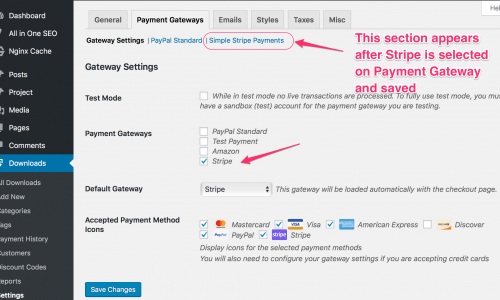 Go to Downloads -> Settings -> Payment Gateways tab, and check the “Stripe” and save changes. Then “Simple Stripe Payments section will appear at the top of the screen. On the same screen above select the Stripe in the pull-down menu. The default gateway is used when the buyer press the Buy Now button if multiple gateways available like PayPal and others. If you use only Stripe, Stripe is used. Enter the 4 keys on the “Stripe Payments” section. Test keys are used when you are in test mode by enabling it on the “Payment Gateways” tab of the Easy Digital Downloads settings, and you can see payments data as the test data on your Stripe Dashboard. If you have any questions or anything, please don’t hesitate to contact me from here.